Sandra Oneal Institute - Why PEM? If you have been diagnosed with breast cancer, your doctor may refer you for a PEM scan. PEM stands for positron emission mammography, a relatively new and advanced application of positron emission tomography or PET scanning. For decades, PET has helped doctors diagnose and treat disease. Unlike large PET systems that scan a person's entire body, PEM is a special form of PET for imaging breasts and other small body parts. The PEM scanner isolates the affected body part and images that area. This produces a very sharp, detailed image of abnormal tissue, such as cancerous tumors. With PEM, doctors can see cancers as small as 2 mm, about the width of a grain of rice. The images obtained with the PEM scanner show the location of suspicious masses, giving physicians a "map" upon which they can base your treatment options and/or surgical plan. Armed with this information, doctors can better determine candidates for breast-conserving surgery or lumpectomy. Also, knowing the exact location and extent of the cancer guides doctors during surgery and helps assure that they remove all suspicious tissue and thereby avoid repeat surgeries. Your doctor may also use PEM to monitor treatment or to check for a recurrence of disease. Like PET, PEM is a nuclear imaging technology. What physicians see so clearly in a PEM image that distinguishes cancer from healthy tissue is the accumulation of an injected, radioactive substance, called a radiotracer, in the cancerous tissue. PEM uses a sugar based radiotracer. Cancer cells accumulate sugar faster than healthy tissue. Essentially, PEM captures a "snapshot" of the cellular activity occurring within a mass or cancerous tissue. So not only does PEM reveal the size, shape and location of a suspicious lesion; it is over 90% accurate in identifying the lesion as cancerous or not, based on its bioactive properties. Your doctor will provide specific instructions to prepare you for a PEM scan. To assure that you absorb the radioactive sugar properly, you should be instructed to not eat or drink anything other than water and nondiabetic medication six (6) hours before your appointment. These instructions may differ if you are diabetic or have low blood sugar (hypoglycemia). Be sure to inform your doctor and clinic staff if you have either of these conditions. Generally, this will not prevent you from having a PEM scan. You may also bring a snack with you to the appointment to eat once the nurse or technologist gives you permission to do so. Other than food restrictions, it is recommended that you wear loose, comfortable clothing to your appointment. At some point during the preparation process, you will be asked to remove your top and bra and given a hospital gown to wear during the scanning procedure. About one hour before the PEM scan, a nurse or technologist will take a drop of blood from your finger to test your blood sugar level. If it is within the acceptable range, a small amount of radioactive sugar will be injected into your arm. You will then be directed to a quiet room and asked to sit still in a chair or lie comfortably in a recliner for about 60 minutes, giving your body ample time to absorb the sugar. After an hour in the quiet room, you will be brought into the PEM scanning room and seated in a chair. The technologist will scan each breast separately, positioning each in the PEM scanner as with a mammogram. Each breast will be gently immobilized for approximately 6-10 minutes per scan. 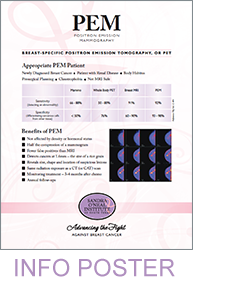 A typical PEM examination includes at least two (2) scans per breast. The entire procedure, including time in the quiet room, takes about two (2) hours, so be sure to arrange your day accordingly. A PEM examination is not the kind of procedure that produces instant results. The scans must be read by a radiologist or doctor who specializes in nuclear medicine. The doctor who reads your images will prepare and send a report to your physician within 24 to 48 hours after the PEM exam. Your doctor will then inform you of the results. The same radioactive sugar injected in the patient's arm prior to a PEM scan is routinely used for other medical imaging procedures. The radiation exposure due to the amount of radioactivity contained in the sugar injection is about the same as that for a CT (or CAT) scan, a technology that has been used for decades. The radioactivity in the sugar fades quickly and leaves no detectable trace after 24 hours.